Home » The towers of San Gimignano – medieval frenzy or architectural genius? You simply cannot help it but notice them. Approaching San Gimignano is quite exciting – you immediately see the town perched on a hill and the skyline with the medieval skyscrapers. They call San Gimignano the city of towers and indeed there are 14 medieval towers in this small town in Tuscany (Italy). The towers of San Gimignano together with the whole historic centre are proclaimed a UNESCO World Heritage Site. Read more: Are you planning your Tuscan holiday? Then check out another beautiful hilltop town – Volterra! And add for sure a day visit to Florence on your itinerary. DISCLOSURE: This post contains affiliate links. If you purchase one of the products via these links, I may earn a small commission at no extra cost for you. Thus, you are helping me to pay for the hosting of this blog, for example. This is not a sponsored post and I have paid all expenses associated with my visit to San Gimignano myself. All opinions are mine. 1 Why there are so many towers in San Gimignano? 3 Where to stay in San Gimingano? Why there are so many towers in San Gimignano? How come that there are so many towers in San Gimignano? Why did they build them? Well, the answer is quite simple – to show off. San Gimignano developed as a village from an earlier Etruscan settlement. In the Middle Ages the place was an important stop on the Via Francigena – the ancient pilgrim route from Canterbury to Rome via France and Switzerland. San Gimignano had also a strategical geographic position on the road between Pisa and Siena. Thanks to this and the production of saffron and wine (Vernaccia being the most popular), and of course to money lending, San Gimignano prospered and developed as a wealthy place. In 1199 the town became an independent city-state following the tradition of the Italian city-states started in 742 by the Republic of Venice. Torre Grossa as seen from the crossing of via di Quercechio with via Costarella. San Gimignano was also no stranger to the dispute spread across the whole of Italy between the Guelfs and the Ghibellines. The first were supporters of the Pope and the second of the Holy Roman Emperor. In the case of San Gimignano these were the two families Ardinghelli and Salvucci. Out of this economic and political rivalry there were born the towers. Each one came to show the political and economical power of the respective family and by the end of the 14th century there were 72 towers in San Gimignano. This frenzy had to be stopped somehow and in 1255 the city council passed a law according to which no private tower could be built higher than Torre Rognasa which belonged to the City Council Palace (Palazzo Comunale). Torre Rognosa was the highest tower at this time, dominating the city with its 52 m.
Tip: If you are staying in Florence or Siena, you can book a tour to San Gimignano with GetYourGuide! If you book the one day tour of San Gimingnano and Volterra, then read here my complete travel guide to Volterra. Most of the towers were actually tower-houses. Initially the rooms were quite tiny as the walls of the towers were about 2 m thick. On the ground floor there were the workshops, on the first floor the bedrooms and the second floor the kitchen, so that in case of fire the living space won’t be affected. With the time the towers and the materials they were built with evolved and there started appearing adjacent buildings thus creating a whole complex – the palace (palazzo in Italian). On the way back from the Fonti Medievali (the Medieval Springs) - the towers of San Gimignano are dominating the skyline. At every corner in San Gimignano there awaits a tower! That's why they call it the "city of beautiful towers". Via San Mateo is full with small souvenir shops and cafés. At the bottom of the street you can spot the towers on Piazza del Duomo. Today, in the Manhattan of the Middle Ages, there are left only 14 towers. On this map you can see where the towers of San Gimignano are located. It is not know whether the bell tower of the Collegiate Church (the Cathedral Church of San Gimignano) belonged to an older church or was one of the many tower-houses before it became part of the Cathedral (Il Duomo). These two towers of the Ardinghelli family (the wealthiest Guelfs supporters in San Gimignano) are located on Piazza della Cisterna on the corner with Piazza del Duomo. Initially the towers were higher than what was allowed by law and that’s why they had to be trimmed down to almost the half of their original height. This tower belonged to the rich Becci family and was built in the 13th century. It is located near Arco dei Becci on via San Giovani. Campanile della Collegiata - the bell tower of the cathedral of San Gimignano. Torre dei Becci with the Arco dei Becci. This 28 m high tower-house built in the 12th century has a hollow structure. Somewhere in the early 19th century the house-tower and the pertaining buildings were bought by the rich Florentine family Campatelli. In 2005 the descendent of the family Lydia Campatelli donated the complex to FAI (Fondo Ambiente Italiano – the National Trust for Italy – a non-profit organization that protects the Italian physical heritage). Today, Torre Campatelli is a museum open for visitors. This tower was built in 1280 by the Useppi family and later belonged to the Chigi family. In 2002 it was bought by the Cilemmi-Giachi family. The Chigi tower is located in Piazza del Duomo and overlooks the Collegiate Church. Also called Torre del Podestà, Torre Rognosa is one of the highest (52 m) and best preserved towers in San Gimignano. It was built around 1200 and belonged to the Gregori family and later to the Oti family. After the Podestà (the mayor) moved from the old to the new palace, the tower was used as a prison. The tower of the Palazzo Pellari was built somewhere in the early 13th century. It is located in Piazza Pecori. Piazza del Duomo is the focal point in San Gimignano. There are 3 towers directly located on the square. Piazza delle Erbe with Torre Grossa (to the right) one of the twin towers to the left and Torre Chigi in the middle. Each Thursday there's market on the square. Torre Chigi and Torre Rognosa on Piazza del Duomo. They were just building a stage for an open-air performance on the square. This is one of the highest towers in San Gimignano, built in the 13th century. It was more like a defending structure and was part of the old city gates. The Tower of the Devil – the legend says that one day the owner of the tower returned home after a long journey and he noticed that the tower was taller than when he left. He said that this was the work of the Devil and this is how the tower got its name. With its 54 m it is the highest of all towers in San Gimignano. This is also how it acquired its name – The Big Tower. The building started in 1300 and was finished in 1311. The tower is adjacent to the Palazzo Comunale (the City Council Palace) and is located on Piazza del Duomo. 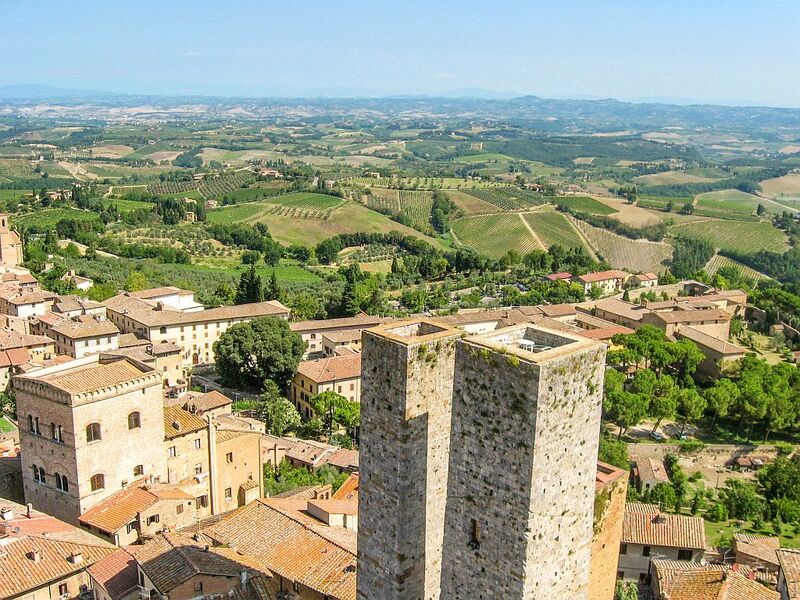 When in San Gimignano, you should not miss climbing the tower. From the top there’s an amazing view of the city and the surroundings. San Gimignano has its own twin towers – the Salvucci Towers – built by the rich Salvucici family, of course to show off their power and wealth, they had to be trimmed down later as they exceeded the maximum allowed height of 52 m. Today, the towers are open for visits and you can even stay in one of them. Piazza della Cisterna is one of the five main squares in San Gimignano. For a very small place, that's quite a lot, or not? Palazzo Pubblico (the Town Hall) with the highest tower in San Gimignano - Torre Grossa. From the top of the tower you have one of the most amazing views in Tuscany. The famous twin towers in San Gimignano (to the left) with Torre Rognosa to the right and Torre Chigi in the middle. Between the Torri dei Salvucci (the twin towers) you can spot Torre Pettini. Where to stay in San Gimingano? If you are not visiting the town on a day trip from Siena or Florence, then there are plenty of options to stay in the city. We went to San Gimignano in the summer and it was a bit touristy, but we spent there a whole week and we could enjoy the place one tower at a time, so for us it felt just right. I would advise you to stay outside of the city walls, thus you won’t be bothered by the tourists. Have you been to San Gimignano? Share your thoughts with us. Or perhaps you want to visit San Gimignano and have some questions – ask for tips in the comments! San Gimignano has been on my list to visit for a long time! Time to fix that! Wow what a beautiful part of Tuscany!! I just did three weeks in Italy, but I’m sad I didn’t get to smaller towns like this one. I’ll definitely have to go back! Wow, the place looks so awesome! I never knew about this place but would definitely love to visit. It brings you back to medieval times. Love it!